Concert hall, built 1971-1983. The complex includes two main concert halls (Sala Ríos Reyna with 2500 seats, and Sala José Félix Ribas with 400 seats), an exhibtion hall (Sala Teresa Carreño), and several rehearsal halls. 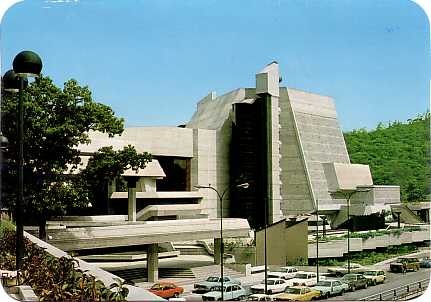 Home to the Orquesta Sinfónica de Venezuela and to the Orquesta Nacional Juvenil. Used for symphonic and chamber concerts, opera, theatre, and ballet performances as well as drama, film, and music festivals (including the annual Latin American Music Festival in November). Named in honour of the Venezuelan composer and pianist, Teresa Carreño (1853-1917), known to her public as the "Valkyrie of the piano". 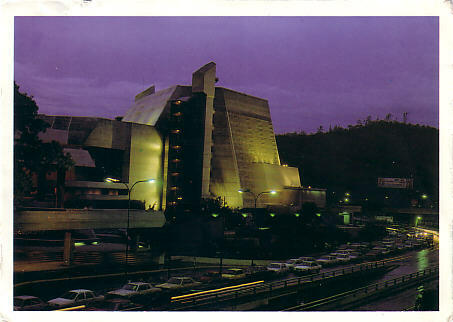 Reverse Text: "Teatro Teresa Carreño, Caracas, Venezuela"
Reverse Text: "Teatro Teresa Carreño, Caracas, D.F."